Peel and section the grapefruits over a bowl, reserving the juice and sections for the salad and dressing. Combine the grapefruit sections and strawberries in a bowl. Toss gently and reserve until needed. In a blender, combine the vinegar, sugar, shallot, reserved grapefruit juice, and salt. Process until smooth. Slowly drizzle the oil through the hole in the lid while the blender is running and process until the dressing has thickened. Remove from the blender and stir in the poppy seeds and grapefruit zest. Toss the grapefruit and strawberries with the poppy-seed dressing. Arrange spinach on chilled plates. 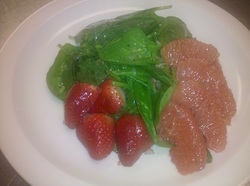 Place the grapefruit sections and strawberries on top. Serve immediately. Chef:Nice plating, nice shine on spinach, citrus sections clean. Overall flavor tangy with enough moisture from the oil, beautiful salad smoothness and texture. Personal/Team: I really enjoy the flavor of the strawberries and grapefruit sections, good contrast of sweet and bitter. The greens had a nice amount of dressing and dressing was well emulsified. Lesson Learned: Texas grapefruits can be sweet and juicy and don't have to be bitter if served with other complimenting ingredients, such as strawberries.